Dubai: The first phase of a development that will see either side of Hyatt Regency in Deira being completely transformed over the next 15 years has been officially launched. Government-controlled Ithra Dubai will be overseeing the “Deira Enrichment Project”. Phase 1 involves 36 plots from Hyatt Regency and stretching all the way to Shindaga Tunnel, and is already several steps into its construction cycle. Tenders totalling Dh3.5 billion have been awarded to date, and this phase will also cover the Deira Gold Souq Extension. This will also be the part to open to the public first — in the fourth quarter of 2019, which will aid the city’s gold jewellers put in fresh roots in what has historically been the most important trading spot for them. The existing roundabout in the area will be replaced a newer set of roads. Later parts of Phase 1 will extend to other trades in Deira, and done in such a way that would “transform our past into landmarks of the future,” said Issam Galadari, CEO of Ithra Dubai, which comes under Investment Corporation of Dubai. This phase would take up six years or so to reach full development, and will include extensive retail areas, offices and up to eight hotels. Phase 2 — for which the master plan is yet to be ready — will cover the area from the other side of Hyatt Regency all the way to the Waterfront Market. A facelift for Deira was something that Dubai’s historical quarter needed urgently. Some of that need is being met by Nakheel’s grand Deira Islands project, which will include the city’s largest mall and much else besides. Now, with Ithra Dubai’s mandate, the charm of Deira can be given a more contemporary look and feel. Going forward, it would also help pull in more tourists, especially when the new Gold Souq extension gets into full flow. But it’s not always smooth sailing — some of the new builds will happen on top of the metro tunnel/station, and which will require some nifty engineering to accomplish the desired results. And another two plots are directly on top of the Shindaga Tunnel. “What was missing in Deira was the greenery and the shading even as the businesses continued to operate,” said Galadari. “The challenge was to get the authorities to allow us to do something that was missing. It takes a long time to get things approved. Nothing much has been done in those parts over the last 30 years. 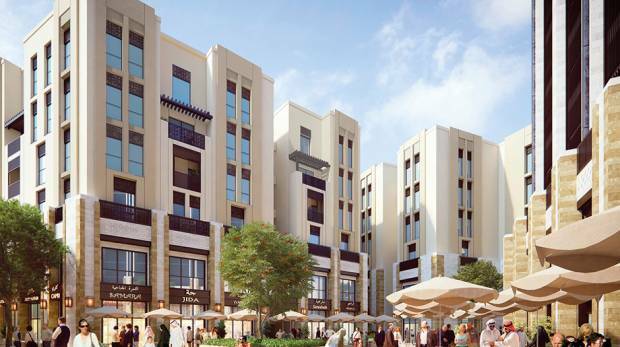 There will be 2,200 residential units added in Phase 1 of Deira Enrichment Project, alongside 840 retail outlets and hotels with 1,400 keys. But there will also much in the form of green spaces and shades in the way Ithra Dubai has conceived the master plan.